Do you have hurricanes in your area? If so, knowing how to react and what to do in a hurricane could very well save you and your entire family’s life! If you happen to live in a spot where hurricanes occur quite often, you need to ensure you know about all of the evacuation routes available to you. When a hurricane watch is given in your specific area that usually means you can probably expect the hurricane to arrive within about 36 hours. If you receive this watch, it is time to start enacting your family’s emergency disaster plans. You need to take measures to protect yourselves. What Do I do after a Watch is announced? The first thing you need to do is bring all outdoor items that could fall or cause damage, inside. If you cannot bring something inside, you need to secure the item to the ground so it cannot blow away. You should have stored away some extra wooden planks or boards for this situation, so get those out and board up all windows! Turn off all gas, electricity, and water. Make sure all family pets are kept very safe at this time as well. If you are living in a mobile home, you should ask a friend to be ready and available to house you during a hurricane. Have your hurricane safety kit close by in case you need any of the supplies. 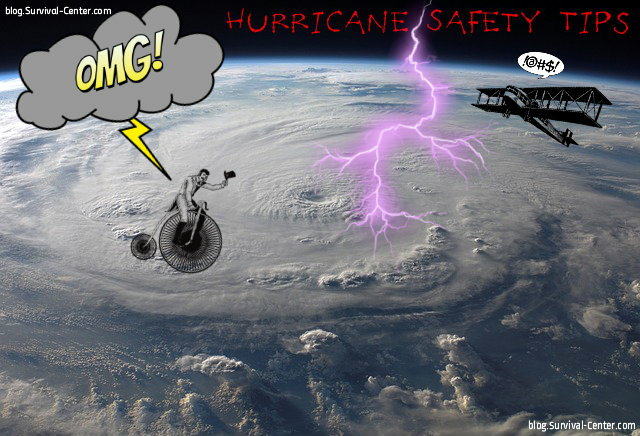 These hurricane safety tips are going to help you stay alive during the actual occurrence of the hurricane! You must remember to stay away from windows and doors. Keep any and all curtains and blinds shut tightly. Stay in a smaller interior room or even a closet or hallway. And if you have to, lay under a table or sturdy piece of furniture to protect yourself. Do not attempt to go outside at all during the hurricane. If emergency evacuation is suggested, evacuate immediately. Make sure you have extra gas in your car in case this happens. If you and your family study weather patterns and know what the high-pressure ridge is in your area, you will be ready when the time comes to either bunker down or evacuate! This entry was posted in Emergency Survival, Hurricanes and tagged hurricane safety tips on March 17, 2014 by David Adams.